THE GOOD Sony’s MDR-7506 closed-back, full-size headphones click with all music genres and are comfortable to wear for hours at a time. They sound excellent for their relatively modest price point. THE BAD With a coiled, pro-style cable and lack of an inline remote/microphone, some will find the 7506s less mobile-friendly than more modern headphones. THE BOTTOM LINE They’ve been around since 1991, but the Sony MDR-7506s are still great sounding — and fitting — headphones for less than $249.00NZD. Introduced way back in 1991, the Sony MDR-7506 has long been a favorite headphone of recording engineers and other sound professionals. The origins of its design date even further back, since the MDR-7506 is, in fact, a refresh of the Sony MDR-V6 that rolled out in 1985. Both models were designed for the pro market, but remain hugely popular with consumers. While the two headphones have the same design and are very comfortable, they don’t sound identical. Both offer very well-balanced sound and excellent clarity for their modest price points — and both are great overall values. But the V6 makes a little more bass and sounds more laid-back and mellower while the 7506 is leaner with a more accentuated treble range, which makes it little crisper and livelier. 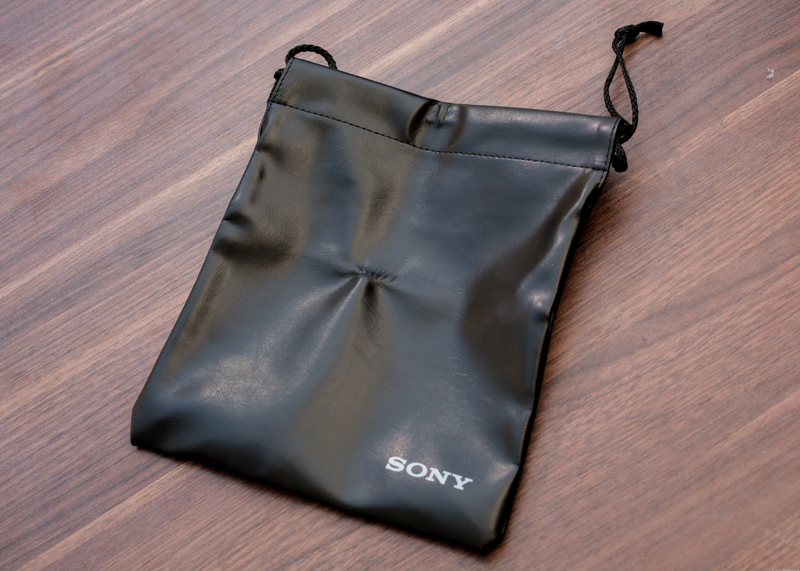 Since the MDR-7506 has been in the Sony lineup for over 20 years, you don’t have to make any guesses about the design’s long-term durability. Some users claim the ear pads don’t last more than a few years, but the pads are user-replaceable and cost just $49.99NZD a pair. The MDR-7506 looks nearly identical the MDR-V6. That durability concern is hardly unique to the MDR-7506. Most similarly priced headphones’ pads won’t be around for the long haul, or the headphones will crap out long before the ear pads disintegrate. Some MDR-7506 owners noted the hinges break, and again, that’s not an uncommon malady for $249.00NZD headphones. But most owners have no complaints. 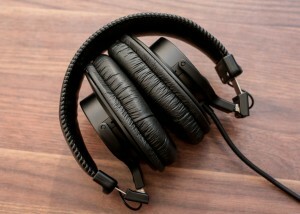 The headphones weigh 8 ounces, which is slightly lighter than average for a full-size headphone. The mostly plastic design doesn’t feel at all flimsy, and it helps that the outer ear cups are metal. Inside, you’ll find 40mm drivers, and the headphones have a 63-ohm rated impedance. The headphones are very comfortable, and their earpads are replaceable. The racetrack-shaped ear pads and headband aren’t as thickly padded as those of many new headphones, but since head-clamping pressure is moderate I found them comfortable to wear for extended periods of time. That should be the case for all headphones, and it’s downright essential for one designed for pro use. The closed-back MDR-7506 blocks a good amount of external noise, and no one nearby will hear much sound escaping this headphone. Stretched out to the max, the coiled cable is about 10 feet long, and it’s permanently attached to the left ear cup. 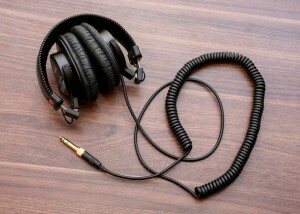 The headphones’ lengthy — and somewhat weighty — coiled cord makes 7505s less ideally suited to mobile use. The extralong cable lacks a mic or remote, so the MDR-7506 may not be ideal for use with phones or portable music players. The cable is terminated with a gold-plated 3.5mm plug; a screw-on 6.3mm adapter plug is included for use with home or pro gear. If you’re looking for differences between this model and the MDR-V6, that model has a nickel-plated 3.5mm plug and 6.3mm adapter. Also, the MDR-V6’s connector housing is matte silver, while the MDR-7506’s is matte black. I like that the MDR-7506’s “L” and “R” markings are color-coded and easy to see in dim light. A no-frills black vinyl carrying bag is included. The headphone comes with a 90-day warranty. 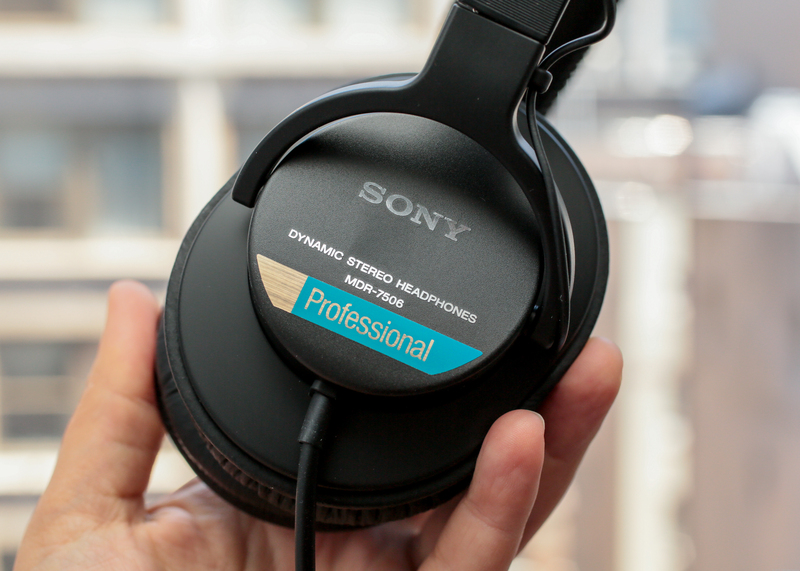 Listen to the MDR-7506 and you’ll know why it’s remained in the Sony lineup for 22 years. Nothing about the sound is out-of-place: the bass-midrange-treble balance is accurate, and every music genre sounds great. It’s no wonder so many professionals have relied on the MDR-7506 to record and mix music, radio, movies, and TV shows. Audiophiles on a tight budget will find a lot to love about this headphone. The MDR-7506 sounded more open and less “canned” than the Noontec Zoro on-ear headphones. 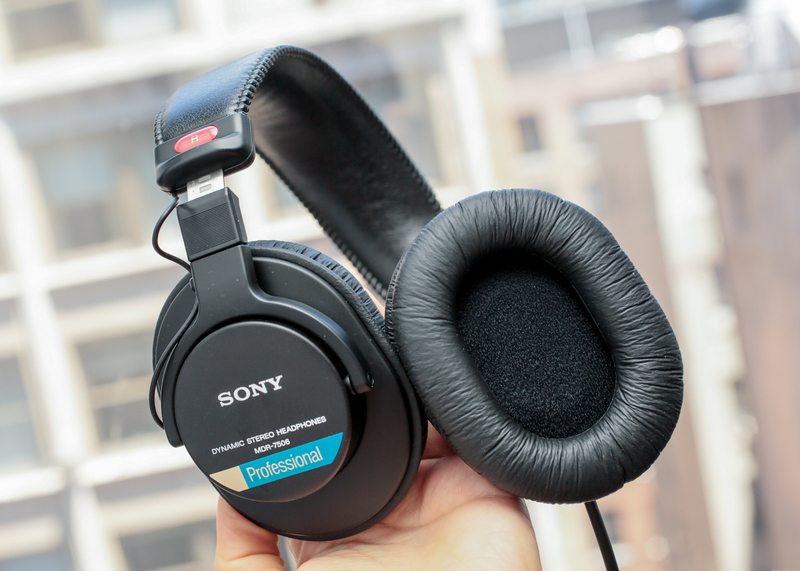 Switching between the two, the MDR-7506’s stereo imaging was broader, less stuck inside my head, and the Sony was more comfortable and provided better isolation from external noise. The Zoro’s treble detail is quite nice, but the MDR-7506 sounded more natural overall. The one area where the Zoro definitively trounced the MDR-7506 was volume capability; it could play a lot louder on my iPod Classic. Comparing the MDR-7506 with the MDR-V6 was interesting; anyone who claims these two lookalikes sound the same should have their hearing tested. First, the MDR-V6 makes more and fuller bass while MDR-7506 is leaner — vocals sound more immediate, and the treble range is accentuated. As noted, the MDR-V6 is comparatively laid-back and mellower, while the MDR-7506 crisper and livelier. Aside from the fact that the MDR-7506 and the MDR-V6 have some drawbacks for mobile use — namely the long, coiled cord and lack of an integrated microphone for cell-phone calls — both headphones have aged extremely well and I’m glad Sony has let them be. As noted, while the two models look nearly identical, they don’t sound identical. I can’t say they’re day-and-night opposites — the two headphones share a similar overall sound — but the differences are significant, so it’s just a matter of picking the one that matches your taste. I’d go for the MDR-V6 — I highly recommend it — but CNET Executive Editor David Carnoy, who edited this review, preferred the MDR-7506. And so did CNET editor Matthew Moskovciak.